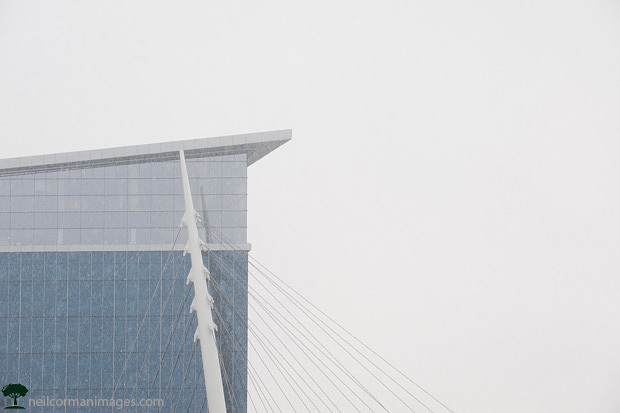 This past weekend I headed out to the Stapleton area of Denver to photograph. This is not an area I have spent much time in photographing in the past and if you have not been to Denver in twenty years you will be surprised at the changes since the airport closed down. The one piece of the airport which everyone notices is the old control tower. 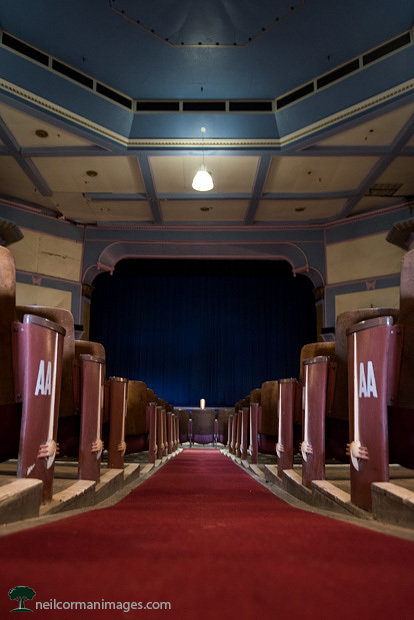 There has been many plans for this building over the years, however it still remains unused. As the sun was setting in Denver I positioned myself to get the sun behind the cab of the building and allowed the rays of the sun to fill from the top as clouds began to move in for the evening. There is much to photograph around Union Station in the lower downtown area of Denver. A couple of months ago I went there looking for something a little different to capture than I have in the past. 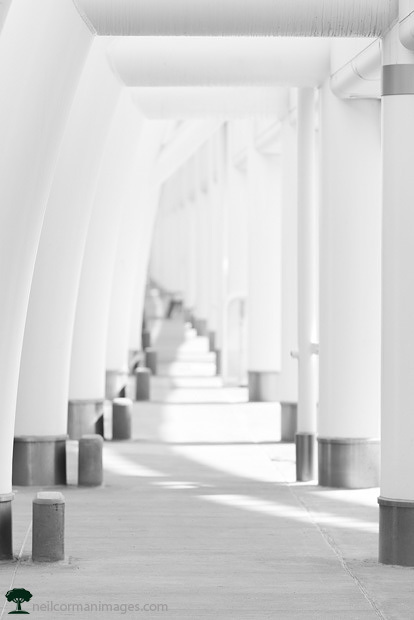 As I walked around the columns on the far side got my attention and I quickly found an angle which would give an endless look of this columns which hold up the canopy at the newly remodeled train station. This past weekend was the annual Doors Open Denver event. One of the places I visited during this event was Elitch Theater in northwest Denver. Built in 1890 it was the centerpiece of the first zoo west of Chicago. The theater served as the first and oldest summer stock venue in America from 1893 to the mid 1960’s. Over the years the area around the theater has changed from a zoo, to an amusement park and now a residential area. Work is being done currently to restore the theater and great strides have been made since the amusement park closed in the early 90’s. Some of the performers who have appeared at the theater include Cecil B. DeMille, Patty Duke, Grace Kelly, William Shatner and many more. Spring is here and so is baseball in the Mile High City. The Colorado Rockies had their home opener last week, however college baseball has been playing along the front range for almost a couple of months. 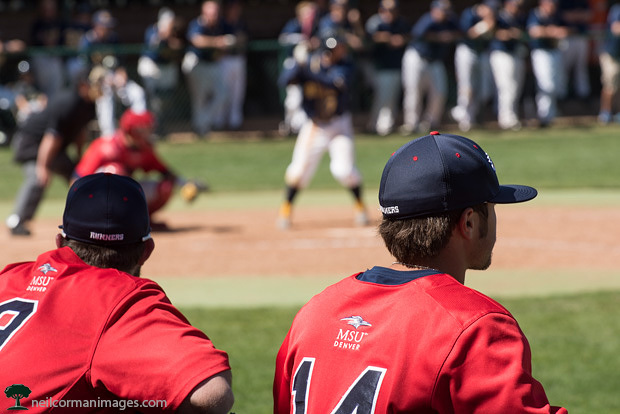 This image was taken during a game between Metro State and Regis University. The son of a friend plays at Regis and as I was watching a game with him I captured some images of his son and also during the game itself. This image was using a shallow depth of field to get an image through the dugout area with the batter a little out of focus. While out photographing near the airport recently I noticed the colors at sunset. I directed my camera to the line of the Rocky Mountains and went with a thirty second exposure to see the motion of the clouds at the day came to a close on a warm winter evening. Using the mountains as a base object it allowed the rest of the sky to move in an abstract form. 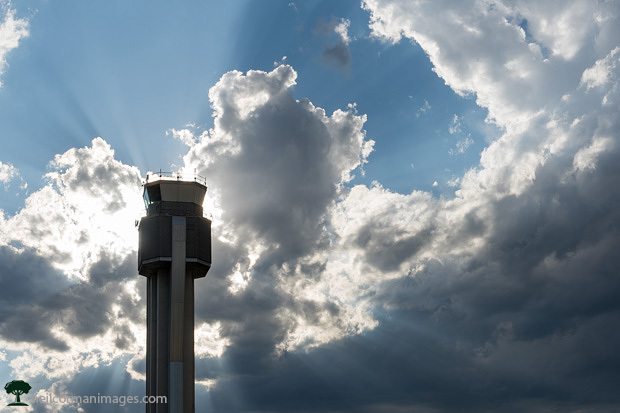 With the warmer winter weather the past few weeks I headed out towards the airport. It was an evening when aircraft were taking off to the north which allowed me to get a little closer then when I did a similar image in 2008 south of the airport. Waiting for the aircraft is always the most challenging part as you are not always certain where the aircraft will turn as the frame is open for a long exposure. 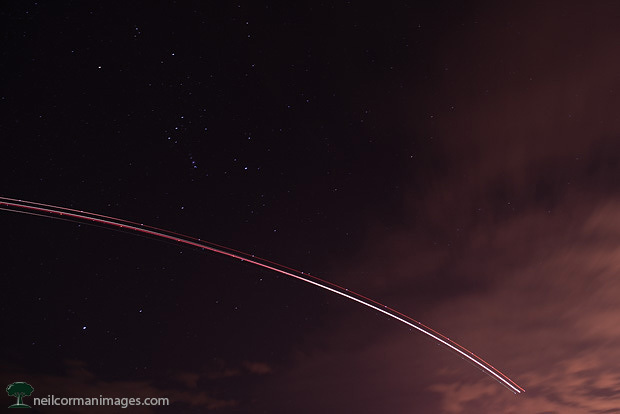 This image is a thirty second exposure as the plane starts to turn to the east just after take-off. With just some clouds in the sky the stars are visible as they begin to show their motion with this length of exposure. 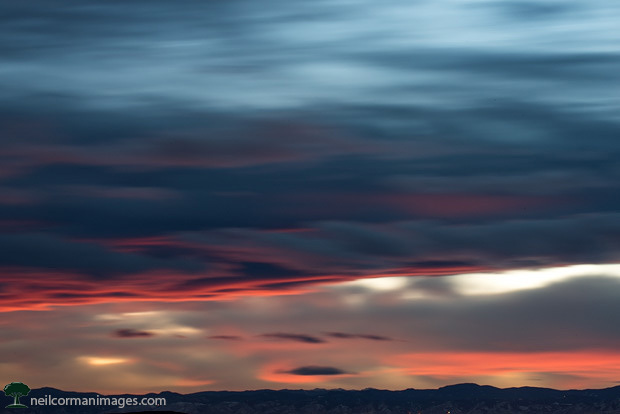 As I have done for the past few years on the first morning of 2015 I headed out to Speer and Zuni to capture the first sunrise of 2015 over Denver. 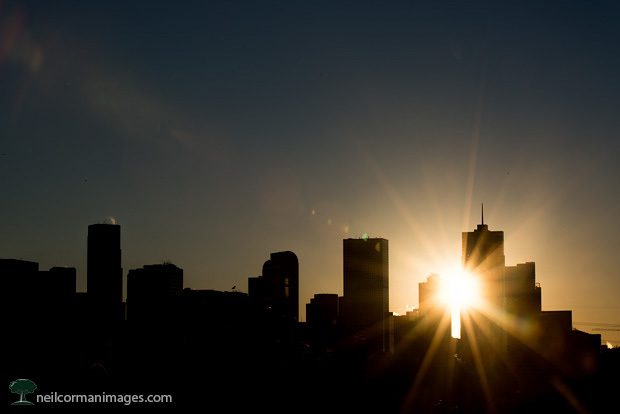 With clear skies this year I waited for the sun to rise to capture the light peaking through the skyline of Denver on a chilly morning. This year a few other photographers were also at the vantage point commonly used to capture the skyline of the Mile High City. Just after the first of the year a significant snowfall came into the Denver area. With this snowfall I took advantage of photographing the B52 outside Wings of the Rockies. 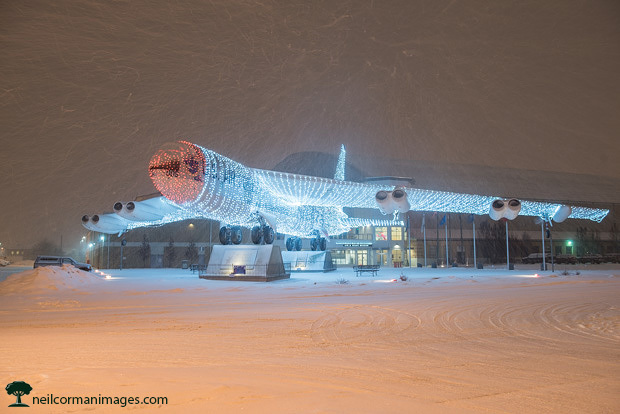 This was the first year holiday lights were placed on this large aircraft. As I arrived to the location just prior to dusk I look at some vantage points and then started photographing as it got dark, at time fighting with the heavy snow coming down right into the camera lens. This was a nice addition to the Denver holiday lights list this year and hopefully it will return in upcoming years as well. On Christmas in 2014 once I headed out to Golden just after the snow started falling the afternoon. Being at some friends not far from Golden I was almost there already so it seemed to be a good decision. The drive out to Golden was quite interesting as the snow was coming down fast at times with the wind blowing. Upon arriving in Golden I was treated to a fresh blanket of snow and plenty of holiday lights. 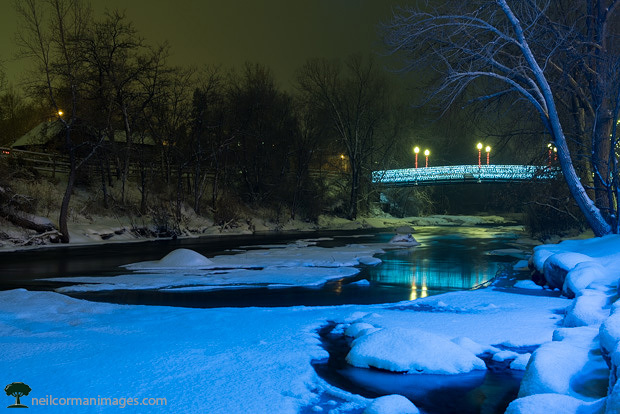 As I was exploring some lights in the distance on a tree I found the bridge and later this vantage point along Clear Creek which was a great spot to capture a snowy Christmas in the Denver area. As construction has continued around the Union Station area there is this view of the Davita Building which still remains, for now. I have been drawn to this perspective as it allows for a simple look at the lines of the building and the perspective of Millennium Bridge in Denver. On this day a couple of weeks ago there was a light snowfall in the city which allows the blueish hue of the building to standout on the overcast day in the city.